The Treblehook pours a medium to dark amber hue with brilliant clarity. A healthy, large head sits atop the beer with a dense frothy consistency with good retention, leaving a pretty solid ring of lacing behind. Settled color is a dark amber through a very still body. Unique bomber in that the glass has a glazing on it that gives a hazy appearance. After popping the cap, our nose immediately perked up with a moderate amount of floral hops escaped from the bottle -- it smelled like it was filled with whole leaf fresh hops. After the beer settled, a rich malt aroma remained and a fair amount of alcohol was present. Initial taste is harshly sweet with an up front blast of alcohol that infuses itself immediately. Catching us off guard are the copious amounts of hops that linger throughout the taste, all the way to the bitter finish. 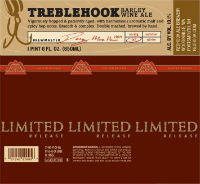 Medium in body and softly carbonated, the Redhook Treblehook is smooth and slightly watery. An oily film coated our mouth, leaving it sticky for a long duration. The 10.2% alcohol was very dominant - not only hot on our tongues, but very warming as it washes down our throats. Our first impression was the amount of hops that were leaping out of the bottle, with an intense aroma that was just like the scent of the hop freezer at a brewery. The 10.2% alcohol was noticeably unbalanced - reducing the drinkability. It would be interesting to collect a couple of bottles, drink one now - drink one in a few months -- and drink one in in a year. Take notes and compare.